Next Saturday’s Valentine’s Day, meaning it’s time for me to share more of my vintage V-Day postcards. “When Tulips a heart entwine / It speaks of Love, my Valentine.” Mailed to Miss Matilda Blessing of Pitts Pa on February 9, 1910, there’s no message or signature on the back … a secret admirer perhaps? All of the text and illustrations are embossed, even the small field of tulips inside the heart-shaped center. A very self-effacing lover mailed the next one to Miss Marie Cornell of Dickinson Center, New York in 1930. “My Valentine / I’m slow, sweetheart. / And shy, tis true. / Yet Cupid loves me – Why can’t you?” This entreaty also was not signed. It’s not embossed, but the colors are still bright, and the scalloped edges shine with glittery gold paint. Finally, sweet Cupid offers a bouquet of roses. Only two inches tall, he was separated from a larger Valentine’s card. The pink ribbon at top is real fabric, and Cupid is swaddled in a soft, folded paper diaper. Want to see more? Check out my 2014 post Vintage Valentine’s Day Greetings, my 2013 post A Token of Love, and my 2012 post Happy Valentine’s Day. I showed you some of my vintage Valentine’s Day cards in my 2013 post A Token of Love, and my 2012 post Happy Valentine’s Day. Valentine’s Day is only a week away, so it’s that time again! Two sweet cupids bring Valentine Greetings. The butterfly wings on the upper one are exquisite! 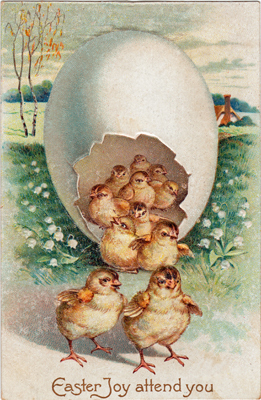 Aunt Bertha sent this postcard to her niece “Dear Little Irene” in 1911. Finally, a bit of Valentine sass. The sheepish little boy looks properly rebuked, and you can see that he even has a little doggie tail sticking out of his cute overalls. With nothing written on the back and no postmark I don’t know what year it’s from or whether the less-than-romantic message was ever sent to a reluctant beau. Digging into my vintage postcard collection to share some Christmas cards with you, I found two wonderful animal-related cards. On a rich dark gold background two beautifully-drawn horses wish you “A Bright and Happy Christmas.” Sweet red flowers – they look like anemones to me – bring a festive feel. This card was sent from Lafayette Indiana to Mr. Edwin W. Savoyer (that’s a guess, it’s pretty illegible to me) of Breinigsville Pennsylvania in 1908, with no written message on the back. Both postcards have one-cent stamps. Which reminds me – buy your forever stamps before the rates go up in January; the postcard rate will go up a penny to .34 (still a great deal in my opinion). And have a wonderful Christmas or whatever you celebrate! Wishing you a Happy Halloween with two scari-licious vintage postcards! Old Halloween cards are relatively rare, as compared to cards sent at Thanksgiving, Christmas, birthday and other holidays. “The Salem Witch” is a linen postcard featuring a scary witch with her familiars — a soaring bat and the witch’s passenger on her broom, a black cat with arched back and puffy tail — flying across the sky above Salem, Massachusetts. There’s no writing on the back, but it calls for a one-cent stamp, which would help to date it. 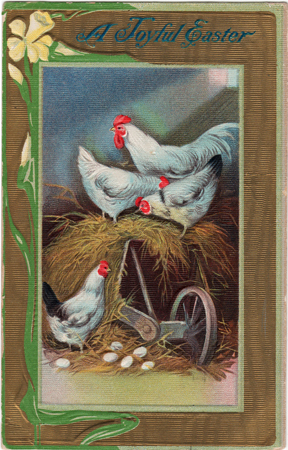 The card was published by the Curt Teich company, and according to one source is circa 1915 to 1930. The other card has a message: “Hear the seething cauldron’s din; Throw your strongest potions in — Swiftly bring my love, unseen, Unto me this Hallowe’en!” A brew of some kind of love spell boils in the cauldron over a blazing fire, and three ravens fly across a full moon. Little grinning pumpkin faces parade across the top. “Mrs K” of Vallejo sent it to Mr. D. Tunney of San Rafael on October 30th 1917. 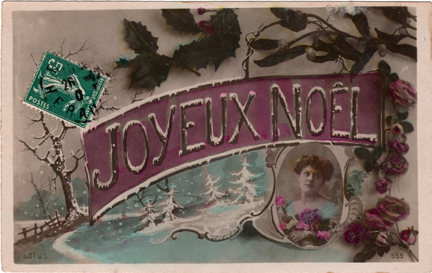 The banner says “Merry Christmas” in French. The adorable mam’selle’s portrait appears to be a hand tinted photo. I think the holly and other foliage around the top and right side are also done photographically, with the snow-dusted winter scene trees and banner drawn in. 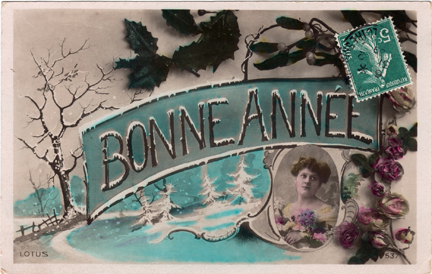 A matched pair, this banner says “Happy New Year” in French, with the same pretty lady and background. Neither card has a date on the back, and I can’t tell the year from the cancelled stamps. Interesting that the stamps are on the front. I guess it’s time to resurrect my college French to do some research into when these stamps were in circulation. Joyeux Noêl et Bonne Année to you!